Approximately 10% of American women have polycystic ovary syndrome (PCOS), a hormonal imbalance that disrupts menstrual cycles and metabolism. At her practice in the Upper East Side of New York City near Midtown, Maureen Moomjy, MD, FACOG, offers diagnosis and treatment for PCOS. If you have irregular heavy periods, have trouble losing weight, or other symptoms, call Dr. Moomjy to schedule an appointment today. PCOS is an imbalance in your reproductive hormones, often related to insulin resistance with elevated insulin and androgens. The hormonal imbalances cause problems in your ovaries, disrupting egg maturation and release and, in turn, contributing to disordered ovulation and infertility. The “cysts” are an increase of immature follicles as seen on ultrasound and are not a true concern. PCOS is a common cause of infertility because it leads to abnormal egg maturation and release. If your body isn’t producing and releasing eggs normally, your chance of becoming pregnant naturally decreases. Hair on your face, chin, or midline of abdomen or chest. If you notice any of these symptoms, make an appointment for diagnosis and treatment. Medical researchers haven’t identified a specific cause of PCOS, although they believe there is a genetic component. They also know that if you have slightly elevated levels of androgen or insulin, you are more likely to have this condition. Dr. Moomjy diagnoses PCOS with a physical exam, full hormonal evaluation, and pelvic ultrasound to examine your ovaries. The hormonal assessment and blood tests may also reveal other conditions that could contribute to your symptoms. Dr. Moomjy provides customized treatments for PCOS. 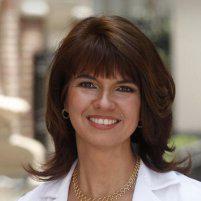 She can help you make lifestyle adjustments to your diet and exercise habits. Getting regular exercise and maintaining a healthy weight can help your body regulate its insulin use and production and can help relieve some PCOS symptoms. If necessary, Dr. Moomjy can prescribe medication including Clomid® or Letrozole for ovulation induction or oral contraceptives or progestin therapy for cycle control, depending on your desires for conception. Additionally, she may consider medication for insulin sensitization, such as Metformin or Glucophage. If you’re trying to get pregnant and PCOS is preventing you from conceiving, Dr. Moomjy can help you optimize your overall health, boost your ovulation with ovulation induction medications or recommend other fertility treatments such as in vitro fertilization, if there are other factors contributing to your infertility. If you have irregular periods and are concerned about PCOS, call Dr. Moomjy to schedule a consultation today.